Is It Good? Death Vigil #7 Review – AiPT! Sejic’s artwork is once again top notch. There is one page where he uses a unique panel layout. The page begins with normal rectangular panels but the entire middle section of the page is a massive rectangle with smaller elliptical panels. It is a fantastic way to display a person’s memories and thoughts. It gives a sense of chaos and continuous motion. On the following page, Sejic transforms these chaotic memories into a more ordered process giving the memories rectangular panels. He is able to capture Clara’s focus in sorting through her target’s memories, bringing order to the chaos. A minor note, but one I believe to be of extreme importance is his ability to show the transference of power from Bernadette to Maria. He does this through the use of one external feature, hair. Bernadette’s hair slowly loses its white appearance turning back to her natural black. On the other hand, Maria’s hair changes from brown to white. Sejic displays how the two are opposites. Not to be overlooked, Sejic’s writing is really good. He is able to provide humorous moments in between extremely tense and emotional scenes. There is one scene where Clara is calling her friend to determine the location of her ex. It is a brilliant scene that anyone can relate to. You are in dire need of information. You know your friend has that information and you ask them point blank for it. Instead, they go on a rant about the craziness that is happening and how you call out of the blue. You get increasingly angry, demanding an answer. They finally understand you mean business and give you the answer. It’s a riot. 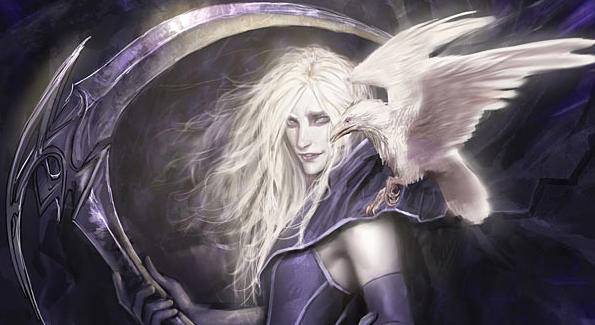 Death Vigil #7 continues to add to the already amazing world and characters that Stjepan Sejic has created. Sejic drops a ton of information, building up mysteries that are yet to be solved. His artwork is absolutely gorgeous to look at and captures character emotions as well as the intensity of the situations. I can’t wait to see what Sejic has in store for the conclusion of Death Vigil. If it is anything like this issue, it is bound to be epic!